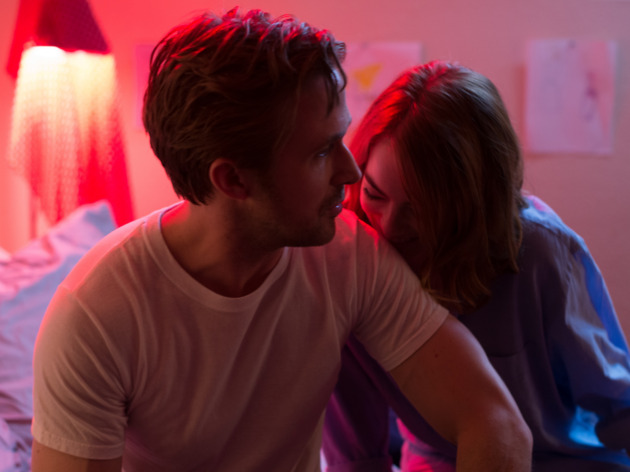 Emma Stone and Ryan Gosling star in a piece of musical euphoria that's as attuned to the genre's past as it is to today's anxieties. The young writer-director Damien Chazelle has followed his Oscar-winning drama Whiplash with another entirely novel film steeped in the world of music. His soaring, romantic, extremely stylish and endlessly inventive La La Land is that rare beast: a grown-up movie musical that's not kitschy, a joke or a Bollywood film. Instead, it's a swooning, beautifully crafted ode to the likes of Jacques Demy's The Umbrellas of Cherbourg and Stanley Donen's Singin' in the Rain that plays out in the semi-dream world of Los Angeles and manages to condense the ups and downs of romantic love into a very Tinseltown toe-tapping fable. La La Land boasts stars to fall in love with: Ryan Gosling is Seb, a brooding pianist and jazz purist who dreams of running his own nightclub, while Emma Stone plays Mia, a more sunny studio-lot barista and aspiring actor who dreams of putting on her own plays. The film follows them from winter to fall and back to winter as they meet, argue, flirt, fall in love and face a growing conflict between their personal passions and romantic hopes. There are tender and imaginative moments to die for: Stone mouthing along to a cover version of “I Ran” at a pool party; the pair watching their legs discover the power of tap while sitting on a bench; the two of them flying into the stars and waltzing while visiting Griffith Observatory—a moment inspired by a trip to see Rebel Without a Cause. There are songs, there are dances (and Gosling and Stone prove easy naturals at both), but there are plenty of straightforward scenes too, especially as the mood sours. Some of those can drag, as if they've floated away from the film's core, but there's usually a showstopper nearby: One late solo number by Stone—an unadorned, conversational singer and a hugely endearing presence throughout—is heartbreaking. 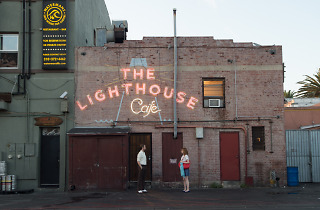 The look of Los Angeles in La La Land could be called Demy meets Edward Hopper: all pastels, soft light, twilight and street lamps. It's set now, but only just, and the film somehow has a timeless 1950s vibe to it too, as if the golden age of musicals was playing out in our own time. The film's delirious, sideways, play-within-a-play view of Hollywood nods a little to the warped likes of David Lynch's Mulholland Drive or Terrence Malick's Knight of Cups. But this is a far sweeter, more generous film, offering up a place where artistic ambition and heady romance can co-exist, at least for a while, and breaking into song and dance can be both deadly serious and a whole lot of fun. I'm not a hug fan of musicals to begin with, but this was pretty ok, the only reason I give it 4 stars is because of the ending (I won't ruin it). It was very easy to follow, there is obviously great chemistry between the two stars is obvious. On the scale of corny factor this actually wasn't that bad, the songs were pretty well intertwined into the dialogue, the dancing was great and the storyline is digestable. Overall I give it between 3-4 stars. A full-star Hollywood musical! Emma Stone and Ryan Gosling are just brilliant on their roles, direction, photograpghy, choreography are all up for Oscar nomination. And on top of all these, the soundtrack will haunt your day and nights for a long long time! Finally, a perfectly made romantic, full of Los Angeles and bright colours musical! La La Land is an award winning romantic musical comedy-drama film. The story follows Mia (Emma Stone) and Sebastian (Ryan Gosling) as they follow their dreams in a town that just wants to crush them. In the process of making names for themselves as an actress and musician, the two fall in love. The scenery, singing, dancing and costumes are all very well done and engaging. La La Land has an inspirational message, which is never give up on your dreams no matter what. It’s ironic that a film about Hollywood didn’t have the Hollywood ending, where the guy and gal end up together and live happily ever after. This movie was brilliant. Beautifully shot and choreographed and perfectly cast; a little indie disguised as a big hollywood blockbuster. The music is incredible and the story is really captivating. Although this is the tale of two kids trying to make it in Hollywood, it is relatable for anyone who has ever had a dream (which hopefully, is all of us). The love story rings vulnerable and genuine - and though the ending is not exactly what I hoped it would be, it captured that very real sentiment. Here, art imitates life, and very much so, vice versa. A must see of 2016. The story and the music in this movie are stunning. (I can't get the tunes out of my head!) 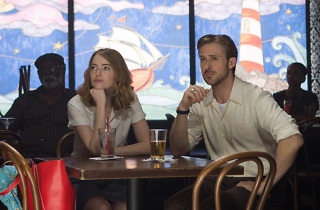 Emma Stone and Ryan Gosling gave amazing performances, but it's weird to have Ryan Gosling as the face of jazz (especially when he's consistently backed up by talented musicians of color). If you see this in NYC, try to see it in a smaller theater with a good audio system. The mixing of the first sequence is a little off, but hopefully a good audio system will help with that.